A University of Ulster student is the first ever from Northern Ireland to make it through to the finals of the prestigious Vodafone DIT Fashion Competition. A total of 48 entries from eight different colleges throughout Ireland competed in the 2013Student Design Award category and Jessica Brandt from Cookstown was one of 10 successful finalists. The BA (Hons)Textile, Art and Fashion student wowed judges with her stunning fantastical creation, based on the competition theme – “House of Chaos: A Twisted Tale”. Entrants were asked to produce an outfit which would reflect how fashion trends and styles are forever changing in a rapid chaotic manner and Jessica certainly stepped up to the mark with her sensational design. “My concept is based around the fantastical elements of nature and how earth could become one with the body. The outfit is made purely of knitted constructions which have similar textures to different elements in nature,” she explained. “By designing trailing knit sleeves and a fringed neck piece I wanted to convey the birth of a hybrid of nature and a bodily form emerging from the ground. 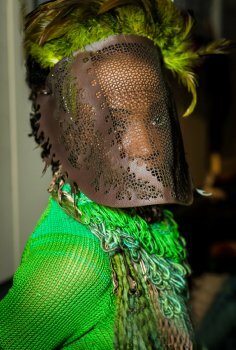 “In concealing the face I’ve tried to provoke an atmosphere of mystery through the laser cut, leather veil - my design is intended to be creature like. Alison Gault, Course Director for the BA (Hons) Textile Art, Design and Fashion Course said she was delighted Jessica had reached the finals. “This is the first year a student from the University of Ulster has entered the competition and the first from Northern Ireland to successfully reach the final stage,” she explained. “It’s an excellent opportunity for Jessica to showcase her talent on a national stage with the rest of her contemporaries in Ireland. “She’s very interested in costume design and this is certainly a growth area in Northern Ireland with a significant rise in the film industry in recent years. “The BDes (Hons) Textile Art, Design and Fashion Course at the University of Ulster is encouraging and supporting students who have an interest in developing work which could be seen as costume design and Jessica’s creation fits well into that category. The DIT Fashion Show celebrates its tenth anniversary this year. It’s now established as a firm fixture on the Irish fashion calendar and recognised as one of the biggest annual student fashion events in the country. The final will take place on April 17 and 18 at Vicar Street, the renowned concert, performing arts centre and events venue in Dublin.